Almost exactly 50 years after Disney released Mary Poppins, the musical that would go on to receive 13 Oscar nominations (the most of any Disney film before or since), comes this charming story of how the film was made. Emma Thompson plays PL Travers, the buttoned-up Australian-British children’s author famous for creating the much-loved character. In 1961, faced with financial ruin and at risk of losing her beloved London townhouse, Travers reluctantly agrees (after 20 years of discussions) to fly to Los Angeles to work with Disney on transforming her book to the big screen. There, Walt Disney (expertly played by Tom Hanks) must try to convince her to sell him the rights to her precious characters. Travers’ spiky demeanour and unshakeable cynicism play out delightfully against the colour and superficiality of the Disney studios, with much humour coming from Thompson’s dismissive one-liners. In-between the Hollywood-set scenes there are flashbacks to the author’s childhood in rural Australia, and as we learn of her troubled family life living with an alcoholic father, the autobiographical influences of Mary Poppins are gradually revealed and the title of the film begins to take meaning. Of course, we know the outcome of the story before it even begins, but director John Lee Hancock does a good job of keeping the pace up until its predictable conclusion. The glimpse behind the scenes at Disney at this point in history is fascinating and even those who aren’t diehard fans of Mary Poppins will enjoy seeing the way the film (within the film) comes together. 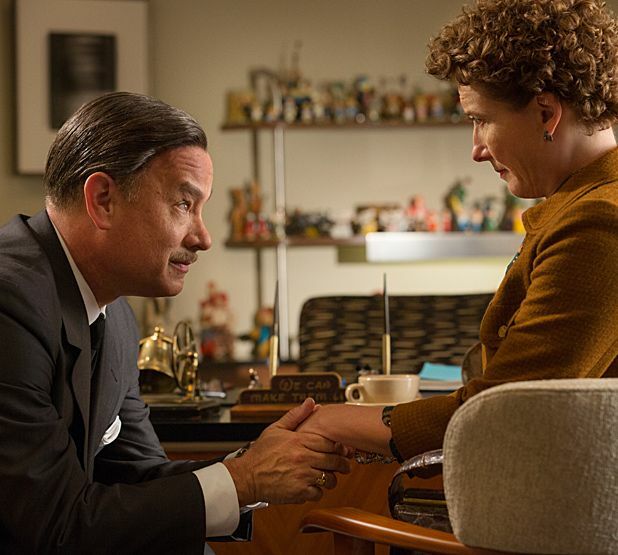 There is a sense that Travers herself might have taken issue with the ‘happy ever after’ tone of Saving Mr Banks (at times it’s pretty sentimental stuff) but the engaging performances and story mean that you’d have to have a heart of stone not to be swept up in it.